There isn’t a shred of doubt. Air mattresses are some of the most comfortable and stylish sleeping mattresses that anyone can own today. While this is true, choosing the best mattress still pose a big challenge to many people and the reasons are so many! For starters, air mattresses come in various sizes, models, and designs that many buyers find so hard to differentiate between. 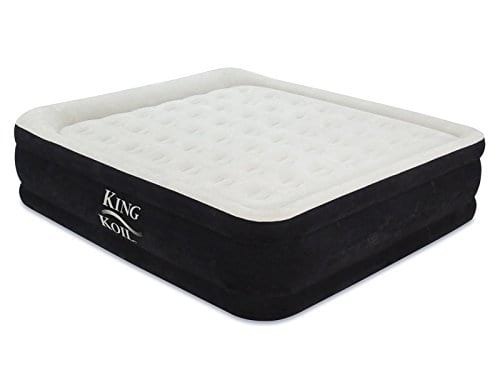 The King vs California King Mattress is one of such designs that has confused many people and most buyers for a very long time. Additionally, there are so many mattress brands on the shelves today. Meaning that for any buyer to get the best mattress they must kiss a thousand more and this can be quite hectic. The best way to go about it is to read the very best air mattresses reviews that you get. 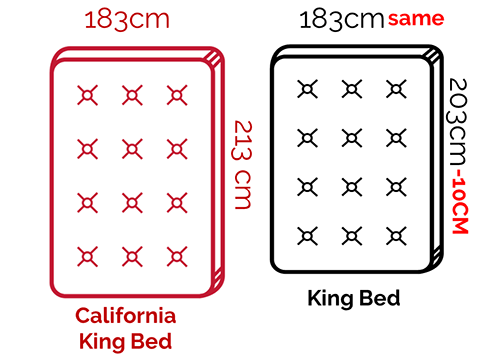 In this post, we are going to highlight the major differences between the king size vs California king size so stay put. Cost King Size Mattresses are larger. They cost more and ever much more compared to Queen Size Beds. Because their accessories are harder to find, Cali King mattresses cost a little more in the overall look. Usage Used in the master bedrooms since such bedrooms are spacious. Used in the master bedrooms since such bedrooms are spacious. Economy of Space Regular King Size beds is best for10’ x 12’ – 12’ x 13’ room sizes. California King is suited for12’ x 12’ – 14’ x 12’ room sizes or more. You’ve probably used both king size and California king unknowingly. That’s okay. However, you should understand that one of the major differences that these two have lie in the size of the width. The King is also known as the Eastern King is the wider of the two. It stands at 76 inches in width while the California King remains at 72 inches in width. In fact, the King is the widest mattress of all and measures 76 inches (wide) x 80 inches (long) as opposed to California’s King 72 inches (wide) x 84 inches (long). Apart from the width, there is also a slight difference in the length. This is the vise verse. Unlike the dimensions that we have seen, when it comes to the length, the opposite is true. The California King takes the day. At 84 inches in length, the mattress is the longest of all designs. It beats the Eastern King by 4 inches. Making it stand at 72 inches (wide) x 84 inches (long) as opposed to the Eastern King’s 76 inches (wide) x 80 inches (long). There isn’t a standard height for the West Coast King (California King) or the Eastern King (King). Therefore you might find a variation in height depending on the model, manufacturer, and most likely brand. Nonetheless, when you calculate the total surface area of the two mattresses, a California King will measure about 6,048 square inches while King will stand at about 6,080 square inches. This makes the later slightly larger. Because of its wide nature, the Standard King size air mattress will naturally provide more sleeping space. This is contrary to the Cali King that’s longer but narrower. Just remember that Cali King is highly recommended for taller people while the Standard King is for buyers who only need a larger space to rest their bodies. Because of its common nature, the Standard King has its accessories easy to find and more importantly quite affordable. This is unlike the West Coast King that comes with a much more patented design. The comfort between the king and California king size will depend on what one likes. However, experts say that when it comes to getting comfy in your bed, having a larger mattress with more space is all that it takes. Because of this, the King tends to offer much more in terms of comfort as opposed to Cali king. There is a need to understand the best room size for your type of bed. For the regular King Size bed, the best room sizes as suggested by our experts should be 10’ x 12’ – 12’ x 13’ as this will be cool and large enough for standard furniture designs. However, depending on the furniture that you need, the choice can be larger than this. For the California King, a 12’ x 12’ – 14’ x 12’ room will be ideal. This will depend more also on how much room you need to move around and also how much furniture you want to drag along. Nonetheless, you can always have a larger room. Apart from the differences that we have highlighted, there are a few things that you must know when it comes to working with king size mattress vs California king size mattress. Some of them include the following. When using these mattresses, you should ensure that you keep at least 61 centimeters or two feet space around the bed. This space is often used to move around freely as you set out some of your bedroom accessories. Because of this reason, both the king size mattresses and the Cali king are never quite recommended for the smaller sized bedrooms that are often found in smaller homes and more specifically apartments. Nonetheless, you should also understand that it’s quite possible to purchase a “Split King Bed” which is basically a King Size Bed that’s simply divided in the center in order to make movement easy. The split king is usually two inches wider than the normal king size bed. If you are thinking of what to get between the California King bed vs. King we would suggest going through with our Q&A. It highlights some of the common concerns that buyers often have when choosing between these two top-rated mattresses. Do I Need Box Springs for California king vs. King? That depends entirely on how the mattress is built and designed and not the size of the mattress. It also depends on the manufacturer’s choices. Why is Western King also Called California King? At 72 inches by 84 inches in size, the Cali King was manufactured around the 1960s and became the largest mattress with high popularity around the State of California and the West Coast. In the following years after it went into mass production around the area before spreading out. I have a King Size Bed Can I Use California King without Changing My Bed? No. In case you change to California King you will have to replace your bed as the two mattresses come with entirely different dimensions. The King measures 76 inches (wide) x 80 inches (long) as opposed to California’s King 72 inches (wide) x 84 inches (long). Can I Use my California King Size Sheets on my Baby’s King? No. You will easily realize when you measure the sheets on that they don’t fit. The two top-rated mattresses differ greatly in size and dimensions. Your king size bed requires its own models and designs. Is Super King Bed the Same as King Size Bed? No! There is an acute difference between the two. The Super King Size mattress/ bed is found mostly in the UK. It is slightly larger than the standard double which measures 54″ × 75″, or 4 by 6.25 feet. This is slightly different from the King Size Bed that measures 60″ by 78″, or 5 by 6.5 feet in the same country (UK). How Much Closer Will I be to My Sleeping Partner? This is what is called motion isolation; the closeness to your sleeping partner and the relative freedom of movement. This is directly attributed to the size of the mattress. Because the Cali King is smaller in width you will be physically closer to your sleeping partner. This can easily cause disruption when sleeping. If you need more space the Standard King will be super ideal always. We believe you now understand how to choose between the major air mattress sizes that you will bump on. This is awesome as it makes your work easy and also fast. Indeed choosing the best mattress size boils down to such comparisons as king vs. California king vs. Queen and should be done with the best knowledge at the back of your mind! Click here to get an easy review to start from.